The month of October holds a special place in our hearts for those have been impacted by breast cancer. This month we’d like to focus on one of our board members, Laura Schwanger. She is our Paralympics Ambassador and a breast cancer survivor. 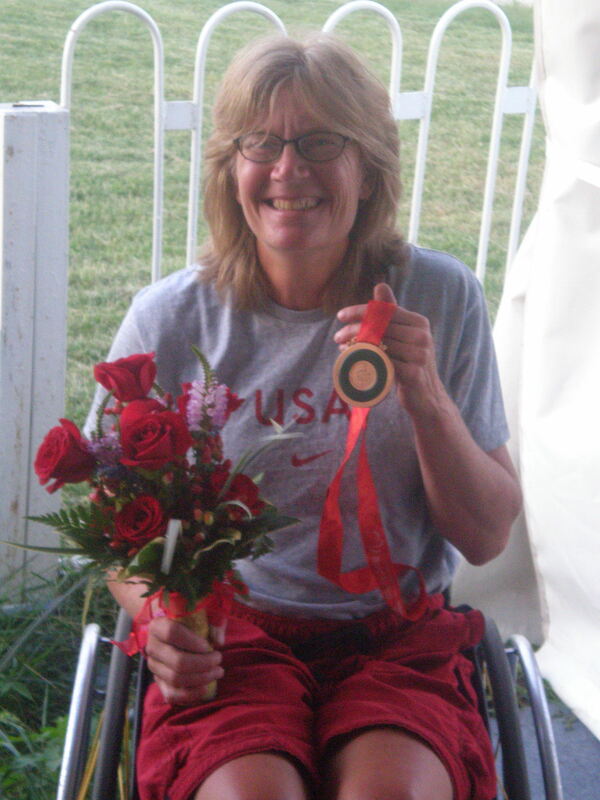 Read on to see how her diagnoses didn’t stop her from pursuing a bronze medal at the Paralympics in rowing! “All Clear!” The two magic words that followed the results from my 9-year mammogram and ultrasound. I can’t believe it’s been nine years. When I was diagnosed, my life revolved around breast cancer, the Big C I call it. My days consisted of doctor appointments, drugs, more doctor appointments, more procedures, more drugs and my body was suffering. I was so weak, weaker than I’d ever been. Was I ever going to regain the strength I’d once had? I could barely walk the dog without collapsing when I got home compared to the person I was who had competed in 3 Paralympics and won 11 medals. I needed to find something to help get my mind off the Big C. Luckily, I live near Philadelphia where rowing is HUGE and I had a friend who ran the adaptive rowing program. She invited me to join them for their winter conditioning indoor rowing program. Although it took me 4 months to complete the workouts the group was doing, I was getting stronger & stronger. By April, it was time to go out on the water. The coach told me that rowing would be a new sport in the 2008 Beijing Paralympics. I continued my crash course on rowing that resulted in making the National team and competing at the World Championships in Munich, 2007, where I finished in 6th place. More importantly, I secured a boat entry for Beijing. I spent the winter continuing to finesse my rowing skills and traveling around the country in search of warm water and weather. All of my hard work paid off and I secured my spot. Arms & shoulders single scull for the U.S. Paralympics team. In Beijing, I finished 3rd winning the Bronze medal. This was the brightest, shiniest medal I’ve ever won! It was hard to believe that just over two years earlier, I had been diagnosed with Stage 2, invasive Breast cancer. I had come a LONG way, survived the storm and come out a WINNER! I was no longer obsessed with breast cancer. Rowing has helped me to conquer breast cancer, both physically and psychologically. I love talking to women, and men, about rowing and breast cancer. I plan to continue being an Ambassador for this great cause and attend more Row 4 the Cure events this year. Poughkeepsie Row for the Cure a Success!